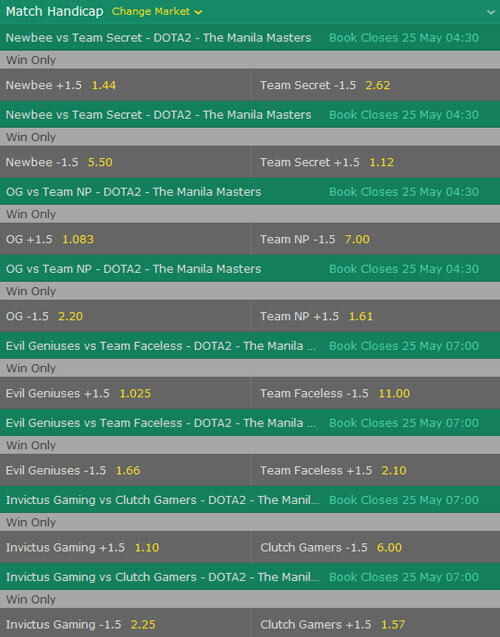 With the Manila Masters 2017 starting at the end of May, the first bets and odds are coming in. 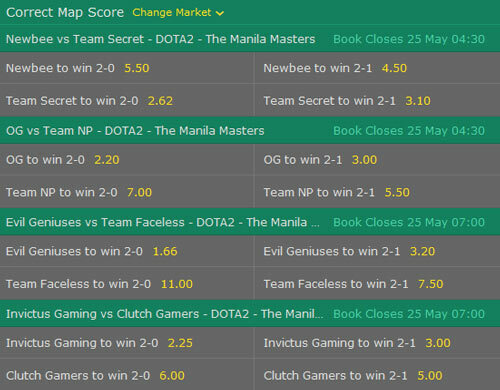 Bet365 is the first esports betting site with Dota 2 betting odds for the Manila Masters 2017 available. In addition they provide us with different bets so everyone can find the one they enjoy the most. 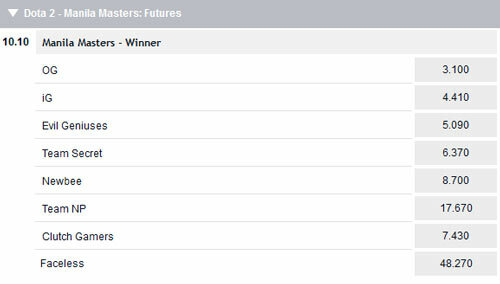 It is interesting to see how the betting sites rank the team and of course OG is firmly placed as the favorite after their impressive win in the Kiev Major. But of course nothing is set in stone, as more and more teams are figuring out the strategies used by OG. With only 8 teams participating in the Manila Masters 2017, this small tournament is a good indicator of form for these teams going into The International 2017 in August. 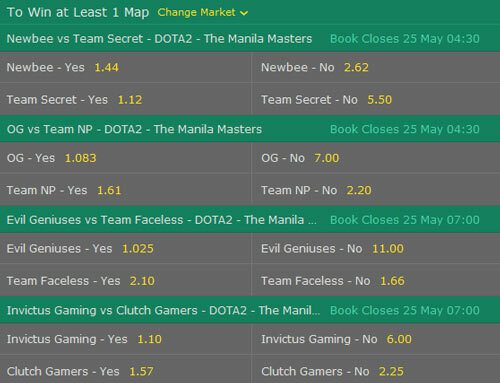 With the bets and odds coming in for the Manila Masters 2017, it is time to present the different betting options for Dota 2 from bet365. There are different kinds and each works a little bit different. 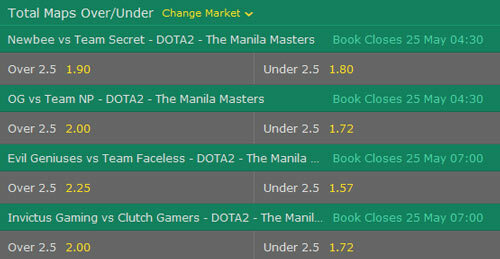 If you know who is going the whole thing at the Manila Masters 2017 then this is the bet for you. One places their bets on one team who they think will go on and be the champions. Of course this is not easy to call with OG, IG and EG all participating and the fans watching live in Manila are surely rooting for teams from the SEA region thus giving them an immense boost in front of their homecrowd. In this bet one places their bets on two teams who they think are going to reach the final. The possibility of winning twice, if both teams are correct, is enticing. On the other hand if only one of the teams reaches the final it doesn't matter if they end up winning or losing for this bet. With only four regions participating this bet is about the region of the winner. A little bit easier to predict than the other two bets, in this one it does not matter if Team A or Team B wins, as long as they are from the correct region. Europe is once again the favorite as they have two strong teams at the Manila Masters 2017 in OG and Team Secret. 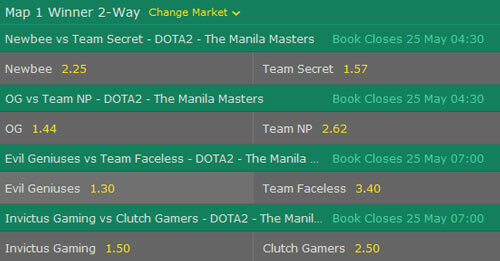 Here you bet on the winner of the direct matchups in the Manila Masters. Teams counter each other with their strategies so the favorite on paper might not end up winning. In this bet you place your bets on who you think is going to win map 1 or two. This does not necessarily mean that they are going to win the matchup, it's only important that the team wins the map the bet is placed on. Dota 2 is a volatile game so it often happens that even favorites lose a map. With matches ending either 2:0 or 2:1 for a team, in this bet you try to correctly predict the score in the end. This is often times hard, because games in Dota 2 can easily be lost just as fast as they can be won. The match handicap bet is often confusing for beginners, but easily understood when explained with an example. Let's take the first matchup as an example. Newbee has a handicap of +1.5. This handicap score is added or subtracted from the final map score. 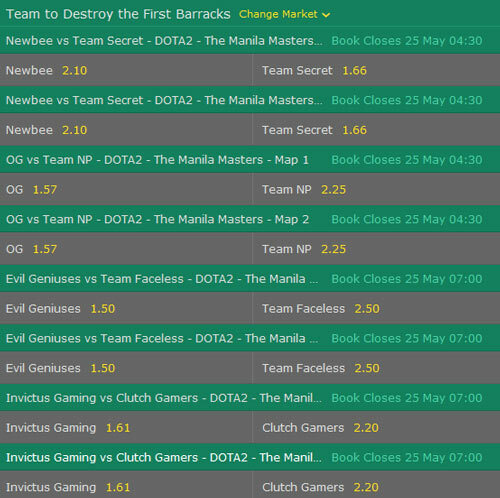 So if you bet on Newbee and they lose 1:2, you still win your bet as 1 + 1,5 is 2,5. This means the endresult is 2,5:2 for the purpose of the bet. 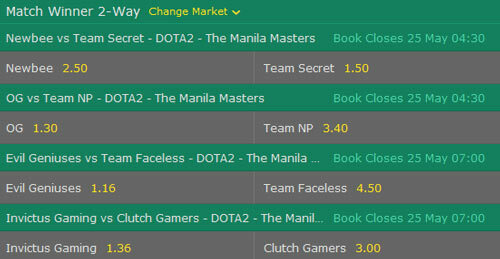 On the other hand if you bet on Team Secret they have a handicap of -1,5. So they will have to win 2:0 against Newbee for a successful bet. 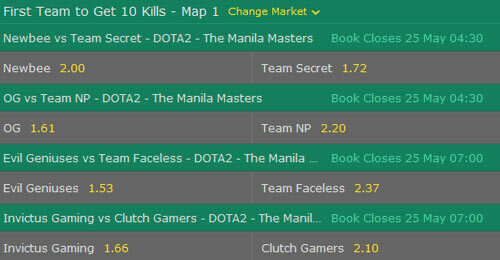 Similar to the Correct Map Score bet, in this bet you try to predict how many maps in total are played. If you think a game is a fast stomp and will end 2:0 you bet under and if you think the teams are even in most areas and the game will go over three maps, you choose over. In this bet you try to predict if teams are able to win atleast one map in their matchups. This does not mean they have to win the whole series, just one map. And as it happens that even favorites often lose a map to underdogs anything can happen in this bet. If you know your favorite team has a very aggressive playstyle and often get first blood in their matches, this bet is for you. 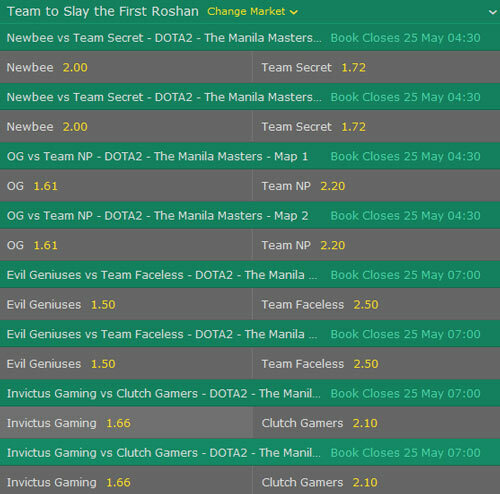 The odds change for the bets on map 1 or two. 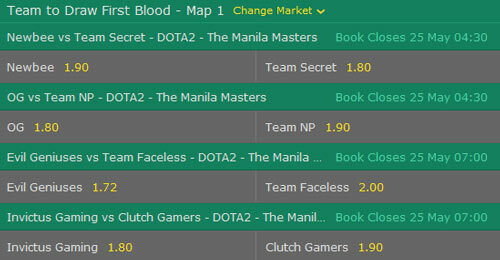 An extension to the first blood bet, here you bet on the first team to reach 10 / 15 / 20 kills on map 1 or two. On bet365 these are six separate bets, each featuring different odds for the teams and bets. They all work the same way, just the amount of kills changes. Here you bet on the first team to destroy buildings, either barracks or a tower in their respective matchups. Towers are more easily destroyed and the first ones often fall under 10 minutes into the match. Barracks are harder to destroy but yield much greater advantages if destroyed. A lost barracks or lost towers often don't mean the end for a team, but their enemies will have gained a big advantage. The other map objective bet. You place your bets on the team who you think will slay the first roshan in the game. Roshan is a very important objective as he drops the Aegis of Immortality, granting a second live to whoever picks it up. This can yield huge advantages to a team.